I think it's funny how even Gravity realized RO became Sura Online and instead of fixing Sura class they just made a whole new class to counter it! oh noe, this is not thread about balance of classes. lets not start talking about that ! Positive replies are being made on RMS! In fact, one of the members said he would make a thread on another server. This is great! We really can win this contest! Those are some very positive responses I'm reading. Interesting that one of the RMS admins posted with a message of support so quickly. Even if only a one-liner, a little acknowledgment is all it takes. *nudges the CMs* EXP Events are not 'support' They're pretty much saying "I have no idea so I'll just do something we do every 2nd month anyway". As for Reddit, you could give it a try posting here. So you made a comment about Reddit that does not necessarily state whether you like or dislike it? Edited by Gantrithor, 16 March 2014 - 05:23 PM. I would very strongly advise against posting there. 2) With that lot even if they do vote for Ragnarok Online instead of Mabinogi, when the time comes that we are up against Planetside 2 or Warframe, that lot will definitely be voting against us. Constructive suggestions are most welcome. I'm tempted to throw this into 2 and 4chan for the sheer number of ex-RO players that I know run around in there. 2chan is a big maybe. 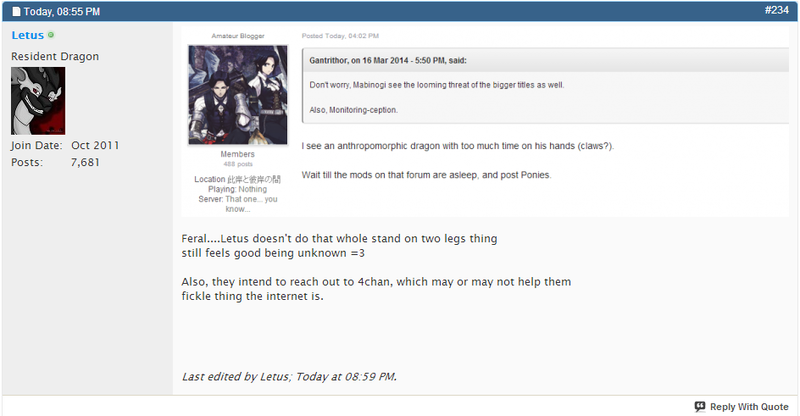 I don't think 4chan is a good idea for a similar reason as any non-RO specific community. Sure they have ex-RO players, but what are they going to vote for, the game they used to play or the game they are now playing and enjoying? We've got popular big name threats that may be coming our way; Planet Side 2, Warframe, Path of Exile, Hat Fortress 2 and as disgusting as they are Maple Story, League of Legends and TERA. The people of 4chan I assume are more likely to vote for any one of those over RO. I'm assuming the winners of each division will then vs eachother right? That's about right, but a compelling argument would sway them. RO has nostalgia factor. I'm not entirely sure how the competition will be decided once all the divs have been completed, but your idea is definitely the most likely. Finally, although I hate to admit it, we're too small in the Western world to achieve victory. This comp is more to do with getting noticed than winning. 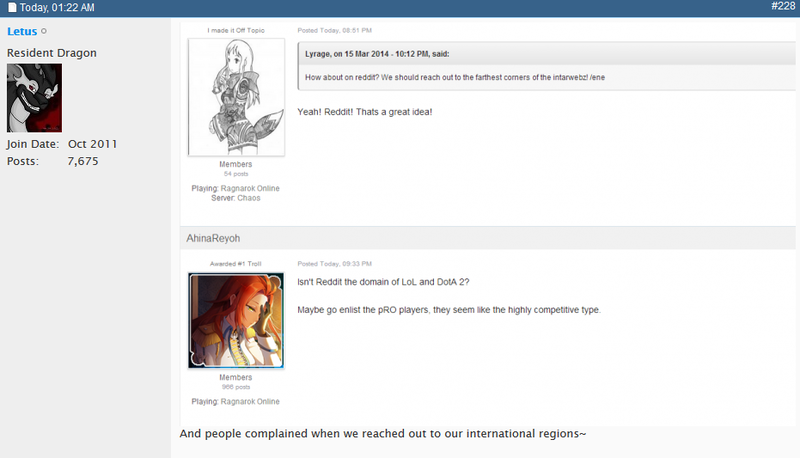 Don't worry, Mabinogi see the looming threat of the bigger titles as well. I see an anthropomorphic dragon with too much time on his hands (claws?). 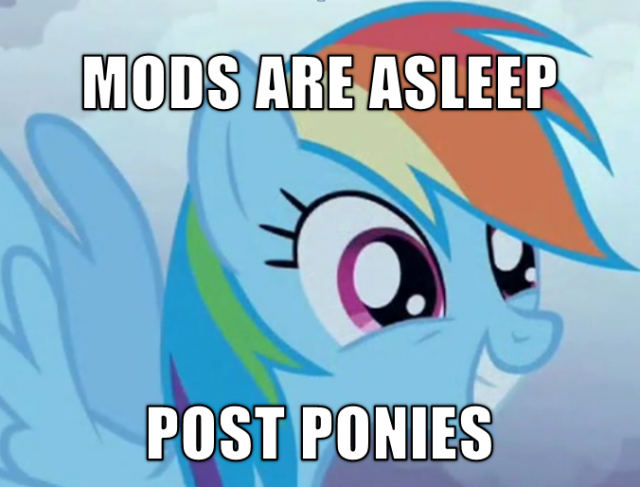 Wait till the mods on that forum are asleep, and post Ponies. "Warning: This build is no longer viable in Ragnarok Online due to the availability of better weapons now, and the fact that a player can use Elemental Converters on their weapon to make it whatever element they want. Players can also use an alt account with a Sage to endow themselves for up to 30 minutes. Elemental converters open up the option of making a carded weapon AND having element bonus. This is a far superior option to just using a forged elemental weapon. Players will find it extremely difficult to make money with a pure forger now, unless selling Very Very Strong Level 3 weapons and thus it is NOT recommended to attempt this build." "Warning: This build is no longer viable in Ragnarok Online due to the availability of better weapons now, and the fact that a player can use Elemental Converters on their weapon to make it whatever element they want. Players can also use an alt account with a [/size]Sage to endow themselves for up to 30 minutes. Elemental converters open up the option of making a carded weapon AND having element bonus. This is a far superior option to just using a forged elemental weapon. Players will find it extremely difficult to make money with a pure forger now, unless selling Very Very Strong Level 3 weapons and thus it is NOT recommended to attempt this build. [/size]"
Well, I still think Mastersmiths are useful for upgrading, so I will keep going. They look good, after all. Mabinogi is watching us guys! Edited by st4rw4k3r, 16 March 2014 - 07:39 PM. Heh, I got screenshotted by our stalker for evidence that more just shows the measures they've already taken. (Hi.) I'm watching this out of curiosity anyway; if I actually cared then I'd be busy recruiting from the artist side of RO. Maybe he can point out how their forum has custom titles too, not like this one where I've been stuck as a troll for years. e: I have the strangest feeling a green plumber is watching me. Specific, sure, but I just get this odd tingle. Edited by AlmrOfAtlas, 16 March 2014 - 08:10 PM. if I actually cared then I'd be busy recruiting from the artist side of RO. Heh, maybe I will actually throw some random drawings later... But I really have no idea what to draw. Since when did this vote thing become so serious? Since I decided to poke the belly of the beast. Then carve it up and use said carvings for their restorative qualities. Besides, we all know that dragons are easy to slay with practiced technique and horrendously OP gear. I've been talking with some people in-game, and apparently a large majority of people on both servers don't even know this is going on. Mabinogi on the other hand has in-game announcements and a topic on the front page of the forum and main site. You can definitely see who cares more. Can we not get the GMs to announce it in game? Set it on a loop like the, [DO NOT GIVE YOUR ACCOUNT OR FACEBOOK INFO TO PEOPLE] / [GMS WILL NEVER ASK FOR PASSWORDS] messages.